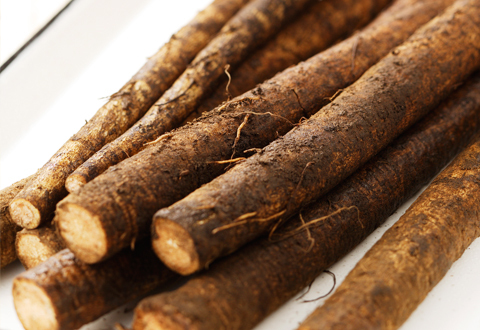 Burdock Root is called ‘Gobo’ in Japanese and is often sold under this name. It’s cooked in a similar way to a carrot and looks a little like one too (except it’s brown on the outside and white on the inside). The taste of burdock is pleasant and a little earthy. In many parts of Asia, burdock is a normal everyday root vegetable that is seen as being very good for the health, especially for the liver and the skin. Seaweeds supply iodine to the thyroid and it help to protect against radioactive elements in the air, water, and food chain. Seaweed is also has high alginate content which can aid the body in detoxing heavy metals. It is important to get seaweed that is from clean ocean areas and not polluted waters. For this recipe, I like cooking with arame, hijiki, sea palm or wakame. Soak seaweed for 15 minutes. If the pieces are big, you can cut them into strands with scissors. Wash burdock root in warm water. Peel and julienne into strips and add to the bowl of soaking seaweed. Sometimes I quickly put the julienned burdock into a bowl with a teaspoon of vinegar (to prevent the root from oxidizing/discoloring) until I’m ready to cook it. Mince garlic and let it sit for 5-15 minutes before sautéing (who knew?! 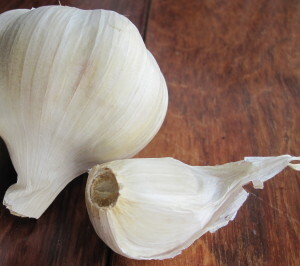 but, exposing the cut garlic to the air a short time before cooking will increase it’s immune stimulating function). Chop onion into ½” pieces; carrots into cubes. Peel and mince the ginger. Sautée the first 5 ingredients in oil until everything softens up a bit, 5-10 minutes. Add the soaked burdock and seaweed. Add a little water as needed (you can used the water from soaking the seaweed). Simmer and cover. At the end, add sea salt and fresh pepper to taste. Or try seasoning with tamari (comes in ‘gluten-free) instead of salt. Written by Lana at 11:27 am and filed under Foods, Drinks, Recipes, Healthy Lifestyle, Miscellaneous, Specific Conditions. This unique content is pretty engaging. I may be coming back to your website. Peel and julienne into strips and add to the bowl. At times I quickly put the julienne burdock into a bowl with a teaspoon of vinegar to shield the root from oxidizing/recoloring until the point that the moment that I’m set up to cook it. Great article. Thanks for sharing a recipe that will detox our body. It will be a nice thing and helpful to many. Before reading this blog, please read this important note from Lana.